Netflix does more good stuff than bad. There are a few in-betweeners but otherwise if you see a review here it is either because we like it, or want to warn you about it. 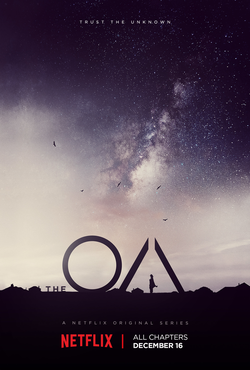 The OA is a little of both if you have the patience to get through it. Not sure where to begin, the show will interest you in the beginning but in its attempt to go deeper it may lose you. Comparisons to Stranger Things have been made on other reviews and frankly, we don't see it. The story starts off well but it is a hard thing to watch and keep your interest once you start wondering where they want to go with it. A girl who was missing for seven years, once blind now returns with the ability to see and do other things. She's a little annoying, whether that is on purpose or not might be best answered by Brit Marling who plays the title character Prairie AKA The OA. It's a little annoying that she introduces herself as "The OA" and no one thinks to ask her what that means at the start of the show. About four episodes in you will likely choose to stick with it, or drop it. Needless to say, if you want to binge on something from Netlflix for the holiday weekend you may want to check other options before you test your patience with The OA. Be warned there are some sexual situations, violence and a lot of cursing from some characters so make sure the kiddies are out of the room.